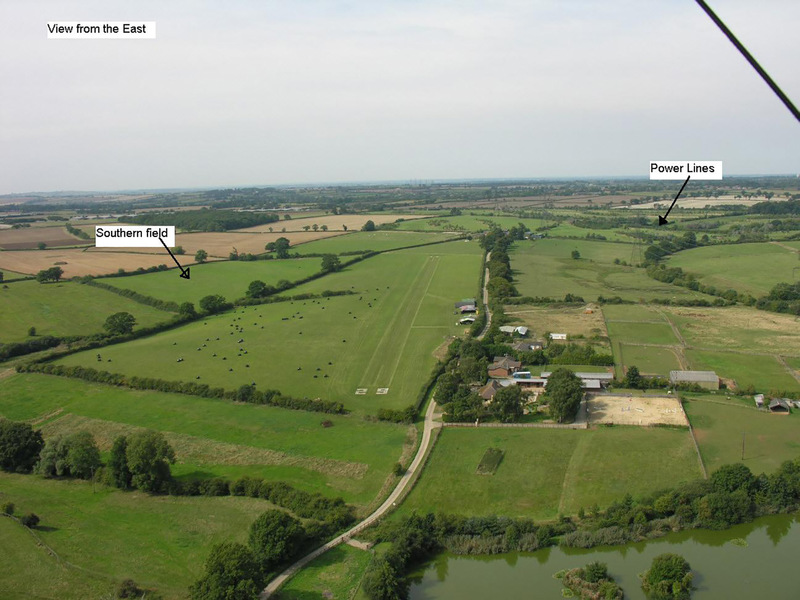 Holmbeck Farm is a privately owned airfield situated between Wing disused aerodrome and Leighton Buzzard. The owners Bob and Rita Perkins have kindly made the facility available to DHPC Members. This is an active airfield and the usual precautions must be taken. You must be a DHPC member, please remember to bring your Club Membership Card. You must receive the days briefing from Bob and learn the current areas to rig, take off, land and avoid. You must have a BHPA Club Pilot (Power) or above and appropriate 3rd party insurance. This is a airband radio airfield…135.475 MHz, or telephone for prior permission. IMPORTANT: As of August 2018 - the Southern Field is currently out of use for security reasons. Disregard any information about this field in the Site Guide rules below. Whenever you intend to fly, please do not just turn up at the field - but instead, call Bob first on one of the below numbers to ask if it is OK to fly and to arrange to meet for the days briefing. Nine times out of ten it will be OK, but there may be the odd occasion when it is not. There may be a fly-in happening that day, then Bob will advise times to avoid. Bob also needs to make any other aircraft (via radio) that may request landing permission, aware of our presence. When your flying is finished you must log your flights in the log book which is inside the tea room. You must also place your £5 fee in the honesty box. Fees. It is just £5 per day per pilot to use Holmbeck Farm. Please remember to pay Bob. Put your payment in the honesty book in the tea room and do not forget to sign the log book. Radio. It is usual for aircraft to use a radio to request permission to land at Holmbeck, frequency is 135.475. However, Bob understands that not all SPHG pilots have a radio and he has made an exception for us. However, it is imperative that Bob knows you are intending to fly in advance so that other aircraft can be warned of your presence. Directions to the Site. Holmbeck Farm Airfield is located on Soulbury Road just North of Burcott and Wing and to the South West of Leighton Buzzard. 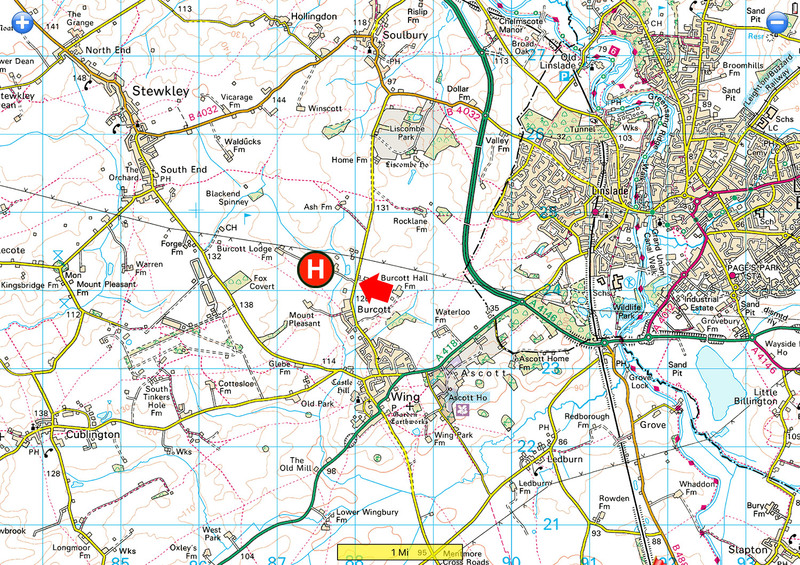 Holmbeck Farm is accessed via a private road off of Soulbury Road just outside Burcott, near Wing. At the end of the drive are signs that say Home Field House and Burcott Lodge Farm. The entrance to Holmbeck farm is about 300 yds down this drive on the left hand side. The field is easily identified due to the windsock and hangars. Call in advance and arrange a time to receive the days briefing. Always keep a good look out. Aircraft may come in to land at any time. Do not launch from the runway. There is no need, there is plenty of land around the runway and SPHG launch time can be extended due to failed take offs. Flailing around on the run way is likely to inconvenience another aircraft coming in to land. Make yourself aware of the no fly zones. There are houses nearby that do not appreciate our presence. Please do not jeopardise our use of this fantastic site by upsetting neighbours. The no fly zones are indicated on the site map. Once airborne either vacate the area for a cross country flight or head for an un populated area (heading South West over the old disused airfield is a good bet). Exercise extreme care when crossing the runway. Do not park on or near the runway! Close the gates behind you. We do not want animals or general public wandering into an active airfield. Carry an up to date airspace map and be aware of surrounding airspace. 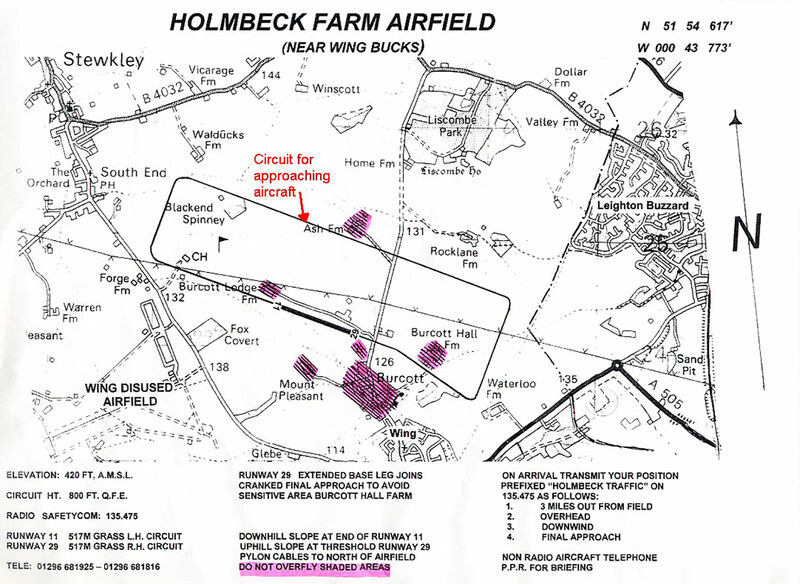 Carry a Holmbeck Farm airspace map. Carry a QNH (AMSL) capable Altimeter and beware of Luton CTA - 4,500ft max height limit. No animals to be brought to the airfield. Make yourself aware of the circuit/approach used by aircraft. You may fly through the circuit area if it is clear to do so but do not loiter in the circuit area. See map for details. High Voltage Power Lines to the North of the field. The Airfield is underneath and right on the border of three Luton Class D CTA's. Please check the Airspace on a current airmap. All Pilots must be conversant with QNH and QNE settings on their altimeter. As from August 2018: The Southern Field is currently CLOSED and access is blocked off due to increased security reasons. There are two fields available to us. The Main Airfield and the Southern Field. Take off and landing is possible in all directions. However beware that there are large high voltage power lines to the North. Therefore, when launching into a wind with a Northerly element use the Southern field. 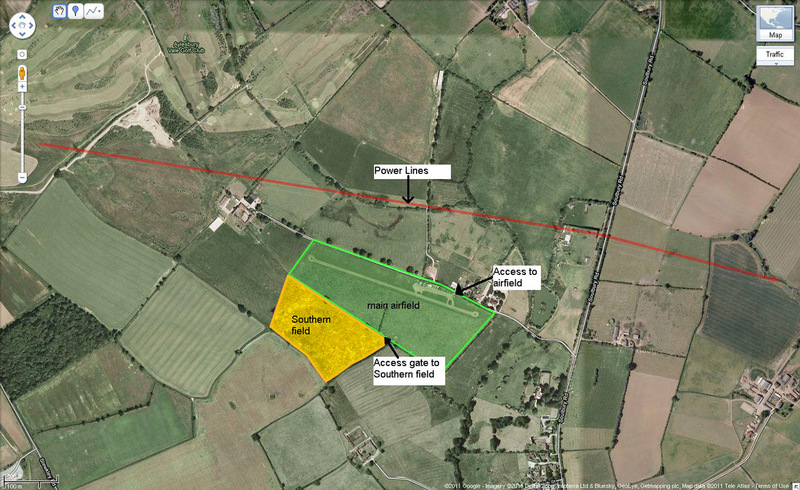 You can access the Southern field via a gate in the south perimeter of the main airfield. This field is purely used by us. It may be overgrown. For all other wind directions: East through South to West you can take off from the main airfield. When using the main airfield park at the top near the hangers. 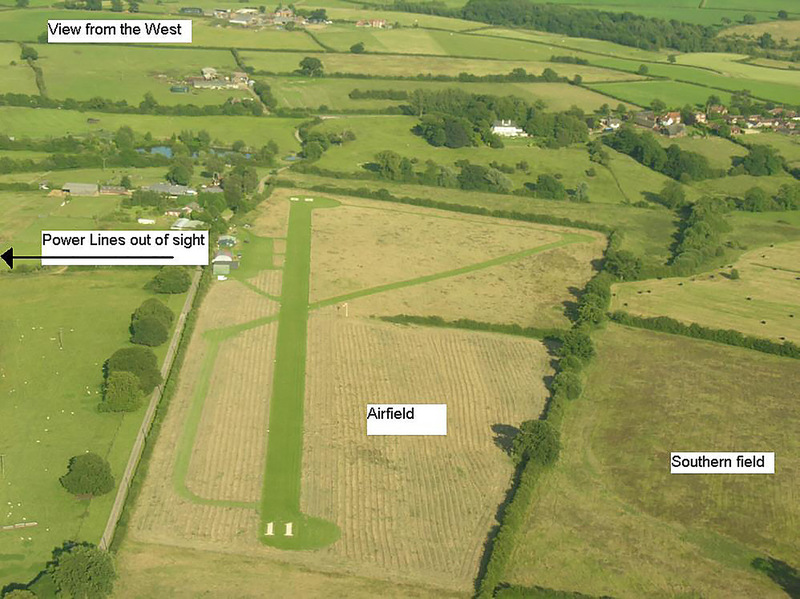 When using the southern field you can drive into the field (via the gate from the main airfield) and park more of less anywhere but be sensible and do not cause a hazard for any SPHGs landing or taking off. Be careful driving across the main airfield. There is a risk of grounding your car at the entrance to the Southern field. A 4×4 is advisable…and close the Gate! In the event of an incident, one person at the scene should take charge and in order to prevent multiple calls, one person should be delegated to call the Emergency Services. Inform the Airfield owners. Details at the bottom of this document. Airfield Ordnance Survey Grid ref: SP 876 242.